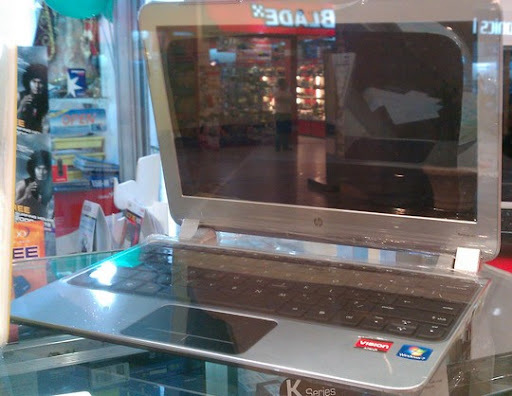 "TP, is HP Pavilion DM1 netbook available in the Philippines? For how much does it sell? Thanks!" Hi Reginald! Thanks for the inquiry! I got your email while I was having coffee in the mall so I decided pay a few laptop shops a visit and for you, I asked them if they have HP Pavilion DM1 on their shelves. Fortunately, some of them do. Reginald, there are actually two variants of HP Pavilion DM1 available in the Philippines right now. We have HP Pavilion DM1 3016AU, which sells for around Php 21,990 and there's HP Pavilion DM1 3205AU, which you can get for roughly Php 22,990. Both variants share a lot of similar technical specifications, including 1.6 Ghz AMD Brazos E350 E-Series Dual Core Processor with 1M Cache, AMD A50M Fusion Controller Hub chipset, 2GB of DDR3 RAM, 11.6" HD Brightview Display, Altec-Lansing Speaker, 6-cell Lithium-Ion (Li-Ion) battery, VGA port, 3 USB ports, an ethernet port, HDMI port, microphone and headset combo jack, multi-in-one card reader, and Wifi and Bluetooth connectivity support. Well, the more expensive 3205AU variant comes with 500GB of hard disk space vs. the 320GB disk space of the more affordable 3016AU. Basically, the Php 1,000 difference covers the additional disk space. hello sir tp, thanks for this review. i like to ask if this hp pavillion has a free cd writer included or just a plain notebook if you take it? I've had a Pavillion and can tell you that they are pretty stylish and well priced.. it worked a treat until 1 day it decided to stop working but that was 3-4 years in so it lived a good life. Highly recommended for fun and stylish minded people.